There was a time when extending the sonic range of the electric guitar meant smashing it into a powered stage amplifier or setting one on fire at the end of a performance. Operating in the background radiation of these more explosive and incendiary activities are musicians like Terrence O'Brien. 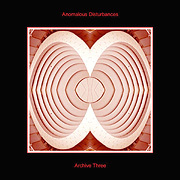 Over the many years of recording and performing under the name Anomalous Disturbances O'Brien has come to comprehend the inside of Spacemusic. Using his guitar and many signal processors to further enthrall the listener O'Brien realizes textural music on a cerebral heading. Fully connected to the moment in the whirling slow rush of a live improvisation he becomes utterly abandoned in his work. Archive Three (64'18") is the result of five live guitar sessions held between 2007 and 2008 - which makes this album an obvious companion work to his Archive Two (2009). The five tracks on Archive Three are each their own unique imaginary construction. Moving elegantly from the quiet and wispy the pieces fill out the listening environment in a particular dense sonic coloration and corresponding atmosphere. 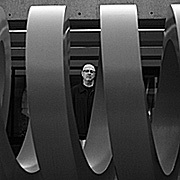 Dark drones subduct the more fragile floating sounds into the roiling surface below while filtered guitar notes sound, recur and blend in a beautiful slow counterpoint - a six string sensibility hidden in the ambient wash. From mysterious undulations to a continuum of enigmatic harmonies and modulations Anomalous Disturbances hints at a world behind the world.